I've become a fan of 8 gauge grounding wire. I used to use 10 gauge. The terminal connectors are more readily available. If it wasn't for a local Ace that has more of this and types of bolts than any Lowe's or Home Depot out there, I wouldn't even be able to do this project. I recommend threaded or twisted wire rather than solid as it's more resistant in the underhood conditions to not break or be as easily effected by corrosion. The essential concept behind why additional grounding wires work is already covered in my Great American Jalopy article. In brief, take a heavy metal tool and listen to each cylinder of your engine. Sometimes I listen on spark plug wires, sometimes on the exhaust, and sometimes on the intake except when it's a V6/V8 and the intake is in the center. You'll hear too much from both sides of the engine to have that be helpful. It's a good idea to be consistent for whatever you listen to as the differences in the cylinders can be listening to them through a different object. Wherever the engine sounds duller you probably have a bad spark plug, or inferior grounding. 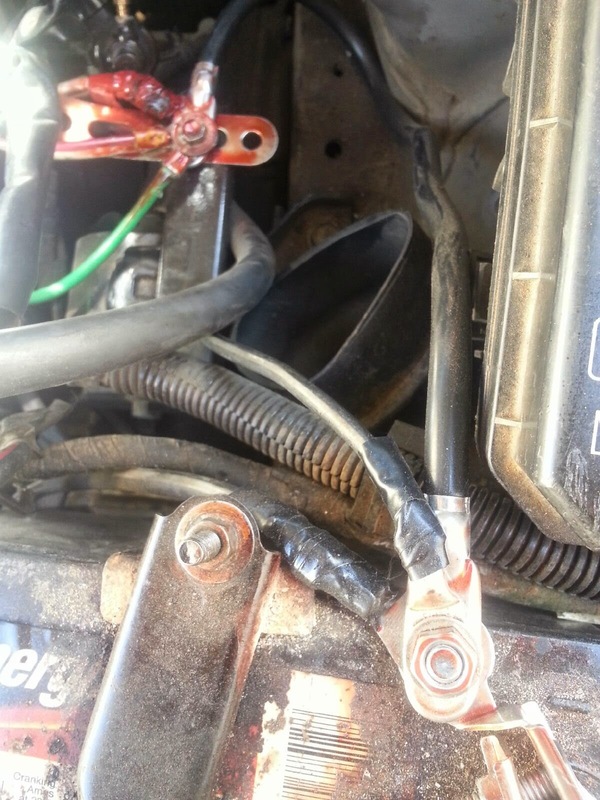 Adding a grounding wire from here, directly to the battery terminal will even out the engine and get that cylinder performing more like his other pals. 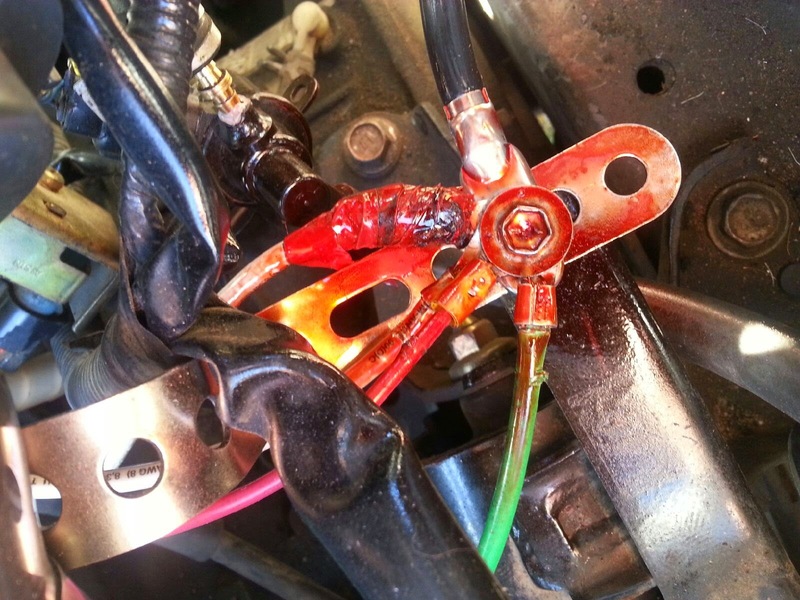 Wherever the engine sounds brighter, don't add a grounding wire there! One of the changes I noticed when I went to 8 gauge grounding wires, is that I found them more effective. In general, you can get more power out of your engine when spark plugs have less resistance to the negative battery terminal. I'm glad I've spent some time reading up amongst professional electricians for the wiring of a house. There was a rule of thumb (don't quote me, I'm no electrician) that once you have more than 2 10 gauge wires, that if you want to carry the load, you'll have to bump down to 8 gauge to carry the heat associated with the electricity. As always, my modifications help your trucks or cars miles per gallon. When I added my first 10 gauge grounding wire 9 years ago, I had a blast accelerating harder than I usually did because I had more power! * It was so much fun. I obviously did worse on that gas tank. So, like always, when an efficiency mod unleashes more ponies under the hood, if you use them all, you may just not get that miles per gallon increase that you were expecting. *that first grounding wire was at the suggestion after church in the parking lot. 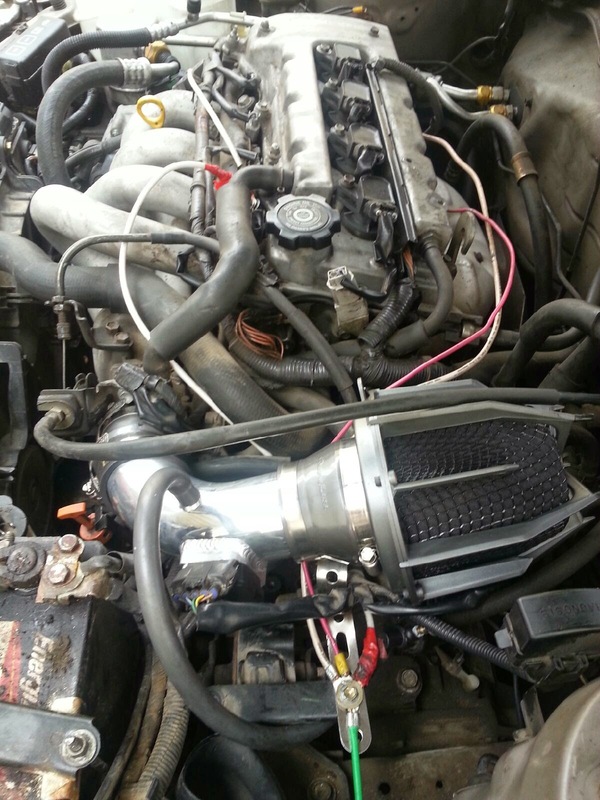 I saw 2 guys under the hood and he was giving suggestions how to get more power. Not being sure I wanted power when my goal was my cars miles per gallon first, I hesitated, but eventually I had to try it. Using grounding wires to even out engines to prolong the longevity and quality of the ride has at most raised me at 8 miles per gallon, and at the least 3 miles per gallon**. This is my idea. The root of the idea wasn't my own, but this application of it was my invention, so please, if you enjoy this article share it, link to it, but don't steal it as your own without linking to it here. **3 mpg better was at the beginning with just the one 10 gauge grounding wire. I check back into these mods every year or so. At first you'll find yourself adding more grounding wires each year to even things out, and after a while maybe once in 3 years. As of January 28, 2017, I've made a video detailing how I balance spark plug gap. The wires I show here are just one way to balance an engine. Getting the spark plugs right are another method, but doing both, you can truly have some great effect! At the end you can see my taken apart engine, and see more of these 8 and 10 gauge wires! :) This video really marries the two subjects together! That's an awesome article! Sure I wrote it, but I feel like it really captured my passion and the success of this idea.